I spoke to Quentin Dentin, the intergalactic star of The Quentin Dentin Show, who has made a cast album to immortalise his game-show musical. Can you describe The Quentin Dentin Show for those who haven’t seen it? I certainly can. 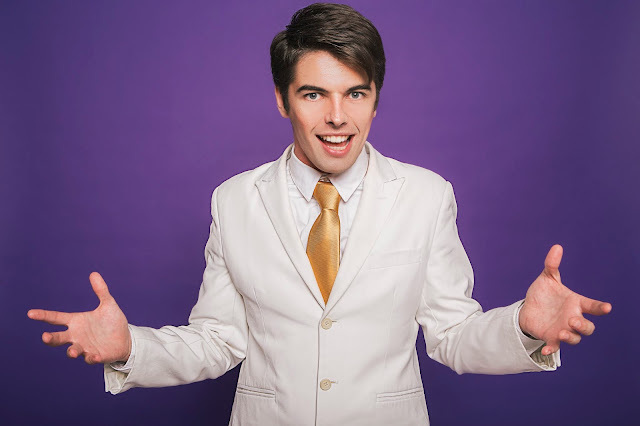 The Quentin Dentin Show is a game-show musical, an interactive self-improvement seminar hosted by me, Quentin Dentin, in which human contestants from the audience compete to have all their dreams come true. The grand prize is a one-way ticket to total happiness for everybody in the building, and everlasting stardom for me. If that all sounds too complicated, just think of it like going to see your doctor - except unlike your doctor, I can sing, dance and prescribe you medication that really works. What was it like to record an album and immortalise the show? It was a hoot. I spent six highly enjoyable months in the studio with producer Paul Garred - taught him quite a bit about music, actually. Working with him, and the cast and band of the 2017 production, I was able to immortalise the show with ease. Immortalising things comes naturally to me, since I'm immortal myself. Do you have a favourite song or moment on the album? My favourite song is the title track, The Quentin Dentin Show. It's so exciting and punchy, with a dark, catchy tune and great lyrics. It's got a terrific pace to it, and a deft arrangement full of mysterious synths, harsh guitars and sudden stops. My voice is on point too. I liked it so much I made a music video for it. You’ve said that the album will tell listeners the meaning of life. Obviously they’ll have to listen to find out what that is, but could you give us a little hint? Life is like a big jigsaw, and people are like little cardboard jigsaw pieces. It's important to fit in, and be part of the big cardboard picture. Ask yourself, what kind of jigsaw piece am I? Do I fit in? If you don't, perhaps you need to change your shape. Perhaps you need someone to come along and change it for you, with a big pair of scissors. You’ve been described in reviews as ‘the future of musical theatre’. What does that future look like to you? I think the future is brightest for musicals that can bridge the gap between theatre and live band gig - i.e., musicals that can have about them a sense of social relevance, of crossover appeal, of cool, and that can make themselves essential to be seen live, in an age when almost everything is available online. Most important is originality, and having something new to say. So many new shows come and go every year. Why do they vanish? Because they were created to fill a spot in a schedule, to iterate on an existing idea or style, or, worst of all, they don't star me! There would be a lot fewer of those, in my future. Are there any plans for your show to return soon? There most certainly are. I can't tell you too much yet, but this year I've been pushing my ghost writers harder than ever and they've come up with an entirely new treatment for the show. Twice as many songs, more story, more plot, more costume changes... I have a feeling that it could be a big ticket. But who knows? You'll have to wait and see. Of course. *clears throat* Pre-order your copy of The Quentin Dentin Show album on iTunes now. Ah... it's so nice to have the last word!